Makes the Staff of Magnus more worthy for a master of the mystic arts. 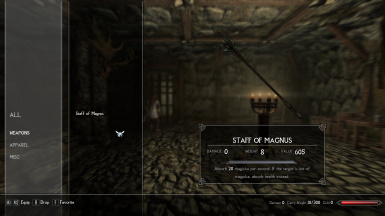 Now actually drains magicka and health properly and gives them back to you, in addition to infinite enchantment charge, the option for soul trapping, and various levels of increased power! You may convert this mod in part or in its entirety back to classic Skyrim as long as you credit myself and Savage Hammer as the original creators. Ordinator-compatible version added. Enairim is ready to launch! Implemented alternate approach to making enchantments infinite, preserving magic effect sound volume levels. Removed enchantment bar. Don't need it! Fixed error in installer preventing certain versions from installing. Created a BAIN installer for Wrye Bash to go alongside the FOMOD installer. Updated all files to use Unofficial Patch (USSEP) changes. Hopefully this fixes the magicka-to-health swap problems. Created FOMOD installer to consolidate all the versions and updated the images. No plugin differences. Fixed Vanilla Empowered (20 power) version. Again. For some reason it was actually 25 power. Created an alternate version of the staff in all power levels that also has soul trap. As long as the target dies while under the drain or soon after, their soul will be trapped. Fixed Vanilla Empowered (20 power) version. Enchantment costs are saved to the magic effect, the enchantment, AND the weapon itself. Don't mind me, beating my head against the wall. Changed Staff of Magnus' effect to a true absorb to match the nomenclature. Applied the absorb template in full, staff no longer affects Dwemer constructs, and is subject to magic resistance. Created a 35 power version of the staff on request. Hope it suits you, Infinibee! Created a 400 power version of the staff on request. Drain the planet, Shaneza! Updated all varieties of Better Staff of Magnus to use the true absorb effect. Uploaded a separate FIX-only file. Reduced enchantment cost to 0, allowing infinite use. Provided 50, 75, 100, 125, 150, 175, and 200 power versions. YES! This was created using the SSE Creation Kit! Feel like the Staff of Magnus isn't all it was hyped up to be? Believe that a staff of ancient power should have more of an impact than it does? Tired of it draining your soul gems, or gathering dust in a chest somewhere? Then you've come to the right place! Better Staff of Magnus replaces the original staff with an empowered version that, at the very least, causes it to spend no enchantment charge to do its thing. After all, why would an ancient staff designed to drain the raw magicka of whatever it's directed at need to absorb souls? Isn't that basically what it's already doing? Absorb (damage) 20 Magicka per second. If the target is out of Magicka, absorb (damage) Health instead. Limited charge. Offered a bugfix version that actually absorbs rather than damages as the wording suggests, but Bethesda actually fixed it by themselves! Holy crap! Standard - Absorb magicka from target, then health if the target no longer has magicka. Soul Trap - As Standard, but also traps the target's soul when they die. Vanilla Empowered - Absorb 20 Magicka per second. If the target is out of Magicka, absorb Health instead. Infinite charge. Magus - Absorb 35 Magicka per second. If the target is out of Magicka, absorb Health instead. Infinite charge. Archmage - Absorb 50 Magicka per second. If the target is out of Magicka, absorb Health instead. Infinite charge. Grand Archmage - Absorb 75 Magicka per second. If the target is out of Magicka, absorb Health instead. Infinite charge. Psijic Loremaster - Absorb 100 Magicka per second. If the target is out of Magicka, absorb Health instead. Infinite charge. Ascendant - Absorb 125 Magicka per second. If the target is out of Magicka, absorb Health instead. Infinite charge. Lesser Aedroth - Absorb 150 Magicka per second. If the target is out of Magicka, absorb Health instead. Infinite charge. Greater Aedroth - Absorb 175 Magicka per second. If the target is out of Magicka, absorb Health instead. Infinite charge. Magnus' Chosen - Absorb 200 Magicka per second. If the target is out of Magicka, absorb Health instead. Infinite charge. Magnus' Destroyer - Absorb 400 Magicka per second. If the target is out of Magicka, absorb Health instead. Infinite charge. 1.) "The staff doesn't want to drain so-and-so's health!" -- Stop attacking for a second, then try again. -- From testing both with and without the mod installed, this seems to be a vanilla issue. The condition for it to swap from magicka drain to health drain is checked when you attack, and for most weapons (or spells) this would be fine as it's checking on each swing (or cast), but the staff is a "concentration" attack. This means it lasts as long as you hold it. It also means it only checks the condition once: when you start concentrating. This is probably possible to fix but would require a hell of a lot of scripting I'm unable to do at this time, consisting of basically rebuilding the conditionals system from scratch for a single item. Alternatively the conditions could be removed entirely as USSEP did, causing both the magicka and health drains to function simultaneously. Maybe in the future I'll make another pass for this. 2.) "I can't hit this guy that's up in my face!" -- The staff seems to have a minimum range. Back up a bit, use a spell, or swap to a melee weapon. -- This may have to do with animations, or otherwise where it's placing the origin of the attack (the beam). If someone gets too close the origin is behind them and will just shoot into the distance. - Implemented alternate approach to making enchantments infinite, preserving magic effect sound volume levels. - Removed enchantment bar. Don't need it! - Created a BAIN installer for Wrye Bash to go alongside the FOMOD installer. - Updated all files to use Unofficial Patch (USSEP) changes. Hopefully this fixes the magicka-to-health swap problems. - Created FOMOD installer to consolidate all the versions and updated the images. No plugin differences. - If you're using one of the Soul Trap versions, this will ensure that you only capture souls of the appropriate size for your available soul gems. No petty souls in grand gems! All thanks to Savage Hammer for the original Better Staff of Magnus, and for permission to upload an update! This mod improves the enchantments of the Staff of Magnus to be worthy of an Archmage. Vanilla - Absorb 20 magicka per second. If the target is out of magicka, absorb health instead. Main - Absorb 75 magicka per second. If the target is out of magicka, absorb health instead. Medium - Absorb 50 magicka per second. If the target is out of magicka, absorb health instead. *As requested have uploaded medium version. -Medium - Absorb 50 magicka per second. If the target is out of magicka, absorb health instead. * Fixed duplicate .esp with medium version.